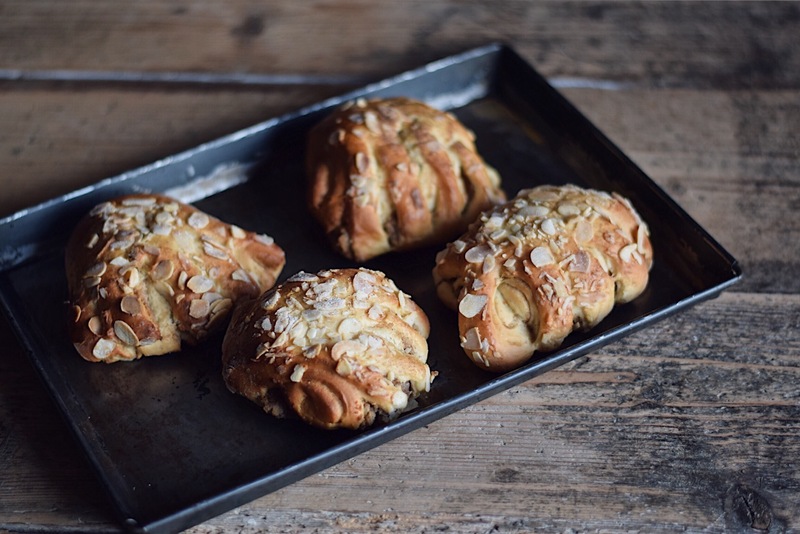 I’ve had a few requests for the recipe I used for the bear claw pastries so I’m posting it today. I’m not such a good baker but I do like to eat cake and pastries so I have a go. I started off making Kanelbullar or Swedish cinnamon rolls only to find that I wanted more of a filling, almonds or fruit maybe. So the pastry making got a life of its own. I made a rich dough and filled it with almond paste and cinnamon sugar and made the bear claw shape, easy and fun. These could easily be vegan by substituting almond milk for cows milk and and using shop bought vegan butter instead of regular butter. All good. Combine all the dry ingredients, make a well in the mix and pour the slightly warmed milk and beaten egg. You can whisk in the yeast into the warm milk too and pour it in when it starts to bubble just to make sure it’s active. Bring in the sides and make a dough ball and knead for 20 minutes. If it’s too wet add a little more flour and start timing then. Alternatively use a stand mixer with a dough hook on medium speed for about 10 minutes. You need to let the dough rise in a warm place for an hour and a half, covered with a damp tea towel. Mix with a little warm water and taste it so you can add more sugar and / or cinnamon. It should be sweet but not as sweet as marzipan. Place on a lined baking sheet and cook at 180C for 15 minutes. As a variation you could use infused dried fruit or stewed apples. And if you want more sweetness you could drizzle some icing made with icing sugar and lemon juice. Hope you give this a try – I’ve been having them for breakfast this week.